I have always used Ariel Liquitabs and love them, but at £11 a pop, they're a little pricey, but worth it for the fresh aroma on laundry day and I am always a person to go with what I perceive to be the market leader. I am a snob like that! Anyhow at the end of the Summer I was asked if I wanted to review my favourite product's new brother - the 3-in-1 version! Now, I write the following with trepidation, but here goes. I got through 2 boxes of it - one sent for review and one that I bought, when it was on a promotional *new* item offer. A long time ago, probably well over a year ago, I was advised on Twitter to stop using softener, so as to help Aaron's eczema. His eczema disappeared within a week. The only thing that would make it come back, was if he got yoghurt on his wrist and didn't wipe it off, or if he wiped his mouth with the back of his palm and it wasn't cleaned immediately. But waking to scratch in the middle of the night, red patches, red inner elbows, all gone! So imagine my surprise, when I'd more or less forgotten about the eczema, and assumed he'd perhaps grown out of it, when as a direct result of using the Ariel 3-in-1s it is back, kicking and screaming. His inside arm, inner arm by his elbow is on fire red, and he wakes up at night to scratch (like the old days) and (which he did not have before) there are lots of patches of what feels like sandpaper areas of skin on his chest, tummy, back and lower back. Now the PR is probaby wondering why I haven't reviewed the item, as it was probably sent to me September time, but I was waiting to see if it was definitely this! It is. Anyway I did 4 loads of washing today, and the 4th load used the final one. So I will update this post in a few weeks, to see if it clears again, like it cleared before, when I gave up softener. For any of you, who LOVE your washing to smell GREAT, if you have children who do not have eczema, then I can't recommend the product enough. It takes the chore out of laundry when you get a spring in your step from it all smelling great. BUT that is not a price worth paying, for my poor boy's skin being on fire, and it is getting worse not better, so we won't be buying it again. Sorry Ariel! 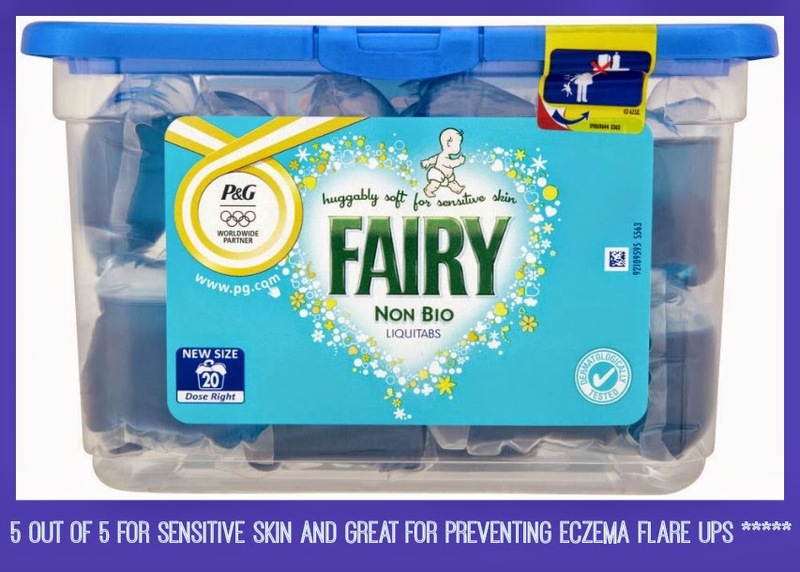 "huggably soft for sensitive skin"
I have not received anything from Fairy, so this post is neither paid for, nor compensated nor is it biased. Very well written. Honesty rocks. Get better soon Aaron. I used to be effected badly by Bold and Daz. My mum would buy when on offer and would make me so itchy. I'd say Persil or surf are better for sensitive skin, or skin issues.